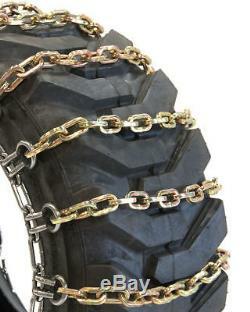 Titan Chain Skid Steer / Loader Square 2-Link Spacing Tire Chains - fits 265/70R. Size based on NACM Specifications. Ladder Square Link Alloy 2-Link Spacing. How many tires does this cover? This tire chain set may need some fitment adjustment since tire chain manufactures make their chains fit more than one tire size and they could be slightly long and may need the side chain shortened. Tire chains or traction devices of any sort carry the risk of causing cosmetic damage to the wheel and tire that they're attached to. This means that even if a traction device is fitted properly whereby the appropriate product is chosen and all necessary measures are taken, there is a risk of cosmetic abrasion to wheel or tire surfaces. The most significant risk is placed upon vehicles with low profile tires, where traction device surfaces are more likely to contact the wheel of a vehicle. This risk is taken upon the installer and operator of the vehicle. Tire chains or traction devices of any sort carry the risk of damaging vehicle components within the wheel area. This means ABS sensors, brake hoses, suspension components, and anything else in the wheel arch may be at risk of contacting the tire chains and causing damage. This risk is most severe when traction devices are fitted incorrectly whereby the chains move from side to side on the wheel in a way they weren't intended to or are too tight and experience abnormal stresses. Tire chains or traction devices of any sort carry the risk of damaging the vehicle they're installed on if they aren't pre-fit and inspected prior to being used. It's important to perform a pre-drive fitment check to see that the traction devices are fit securely to the tire and any tensioning devices are tight and secure to reduce the possibility of damage. Tire chains or traction devices of any sort carry the risk of damaging the vehicle they're installed on if damaged chains are not removed immediately. To increase the chances of an early detection of failure we suggest operators periodically inspect chains throughout their trip. Tire chains that are damaged can cause significant damage to wheels, inner wheel components, fenders, and various other parts of the vehicle. Tire chains or traction devices of any sort carry the risk of damaging the vehicle they're installed on if they're used on a driving surface for which they weren't intended or driven at speeds in excess of 30 MPH. This type of driving will also significantly reduce the lifespan of the tire chains, and increase your risk of vehicle damage from a broken traction device. Vehicle operators who are not willing to accept the risk of tire and wheel scuffing, due to installation of a traction device, should not install or use traction devices on their vehicle and should find other modes of safe transportation. Under no circumstances will Mikes Auto Parts consider giving any form of compensation for the repair of, or replacement of a vehicle, tires or wheels as a result of installation and/or use of a traction device. Traction devices can and will break during normal service life. Gaskets / Sets & Seals. The item "Titan Chain Skid Steer / Loader Square 2-Link Spacing Tire Chains fits 265/70R" is in sale since Thursday, November 17, 2016. This item is in the category "eBay Motors\Parts & Accessories\Car & Truck Parts\Wheels, Tires & Parts\Tire Chains". The seller is "patrickmahoney" and is located in Portland, Oregon. How many tires does this cover?